TJ Rosene was the first speaker I went to at the Atlantic City clinic. The last weekend of April I was in Atlantic City for a really good PGC/Glazier basketball clinic. The clinic ran Thursday, April 28 through Saturday the 30th and offered a number of different speakers during each time slot. One of the biggest issues in my mind, was actually deciding which of the five or six speakers to see at each time. 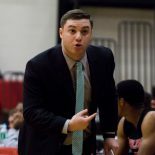 The first speaker I went to see was TJ Rosene, who is the Director of Coach Development at PGC and the head coach of Emmanuel College, a Division II school in Franklin Springs, Georgia. Coach Rosene had a different perspective on attacking zone defenses than I am necessarily used to. At Wesleyan we have some sets that we use to create advantages against zones and run a decent amount of ball screens against 2-3 or 3-2 zones. Coach Rosense wants to space the floor and allow his talented players to create advantages out of free play. My notes from Coach Rosene’s presentation are below. This entry was posted on May 10, 2016 by Coach Sass in Coaching.